A definite box office hit! This is the kinda movie that you don't mind watching again and again. It's just one a kind. And these are the kinda movies which would bring our entire Tamil cinema to the next level. I walked out of the cinema telling myself, that I had just watched a beautiful Tamil movie. Everything was beautiful about the movie. Surya, to start off with as the father and son duo.. He was just simply awesome. He carried himself so well and at every point he marked his signature. Simran to being with, played her role beautifully and with much demure. It was really nice to see Simran acting again and yeah dancing on screen. I just so missed her absence. Loved the way how Gautham has used her in this movie. Sameera and Divya were both at the best and no one can say they are mediocre performers or just plain dumb blonds after this movie. They played their roles up to perfection and left a lasting impression in our minds. 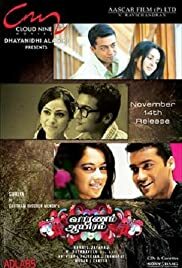 All the songs were beautiful and in particular I loved the "Anjala" song, I never knew it was such a sad song until I watched the movie. On the overall its a movie for all the wonderful fathers in the world.. Its a dedication to all those loving daddies.. A real lovely movie for all! Dun miss it!